By Samantha Phillips | September 8, 2018 at 12:01a.m. Nearly 1,000 volunteers participated in hte 21st annual Day of Caring in Youngstown. Many South Side residents will notice their neighborhoods are a little cleaner, and perhaps safer, thanks to the efforts made by 1,000 volunteers from schools, businesses and organizations for the 21st Annual United Way Day of Caring. A sea of volunteers wearing lime green shirts gathered at the Covelli Centre for breakfast before the Friday event. United Way President Bob Hannon said this year boasted the largest turn-out in the event’s history. Last year, there were 850 volunteers. The volunteers’ tasks varied. They did everything from landscaping to installing smoke detectors in homes. Volunteers that weren’t working in neighborhoods helped 18 nonprofit agencies around the city. “It’s just a day to feel good about the community,” Hannon said. He thanked companies for allowing their employees to spend the day volunteering for a good cause. United Way partnered with the American Red Cross, the Youngstown Neighborhood Development Corp., the city, Lowe’s and Green Youngstown for the event. Huntington Bank and Hometown Pharmacy are among the sponsors. Mayor Jamael Tito Brown told the crowd their participation is key to making better the lives of the families who live in the South Side neighborhoods where they worked. Tonya Rhodes with the group Building Neighborhoods of Youngstown said the amount of volunteers was overwhelming. Sisters Kaylin and Raegan Burkey, came with other Boardman High School students to help. “It feels good to be able to help out in the community,” Kaylin Burkey said. At least 750 volunteers, dedicated their efforts to the Taft Promise Neighborhood Project on the South Side. 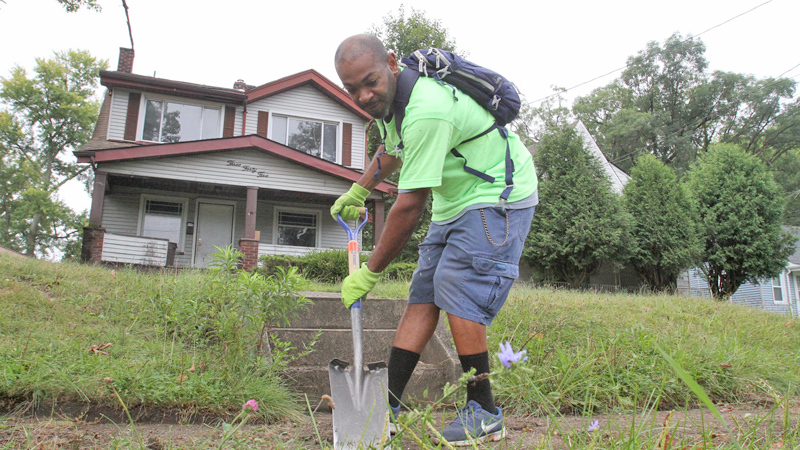 In a neighborhood on Boston Avenue off South Avenue, they mowed the lawns and did landscaping at vacant homes, cleared the sidewalks of weeds and overgrown bushes and chopped down trees in hopes of beautifying the area and making it safer to walk through. September 6, 2014 12:03 a.m.
September 5, 2015 12:01 a.m.